Housepets! - View topic - Housepets Book 6!! Housepets book 6!! Covering the comic arcs such as THE GALLIFRAX PROTOCOL, Jungle Fever, and the beginning of Heaven's Not Enough! Soon to be on Amazon! Jess!!! What you're doing to Bino!? Oh, that's cool! Eh, Jessica, corrupted with a sandwich (but there's sliced pepperoni ). Poor Bino, wondering what wrong thing he did to Keene. I await to buy it on Amazon. THAT will be my Openermas-Present for myself. So much sniffiAAUGH! Get your cold wet nose away! Jess will do it for a sandwich. Wait, what does this title come from? That cover looks really nice, shady Keene is amazing. Forget the puppies. Keene should have gotten Jess to dangle Bino over a vat of bleu cheese! Hey if you want a vat of puppies, then take them and put them in the kiddy pool. For now, its BLEU CHEESE TIME! I would REALLY like to know the Story behind that Cover. I'm assuming that Bino probably ticked off Keene somehow which lead to this little scene. I've got the first five, so of course I'll be buying this! I may wait for Amazon though. He's known to attend conventions and does signings and commissions at those. I know that he's going to be the guest artist of honor at RMFC next August - I'm hoping to get my new book signed there. So it looks like you will have to wait another year so you should start saving now. Awesome! I'll be in my Doug suit, probably (I'll need to save up to buy the ticket and room, though). Oooooh! I'll have to go and take a look later on then! Did he... Is that... Did he draw Rufus?! Fido sure looks buff. moreso than usual. The chicken reminds me of the hen from Quest For Camelot. Dang man! Kevin looks huge! Man is he such a hunk! 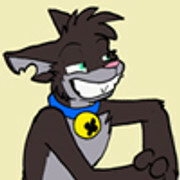 Maybe the hunkiest character in Housepets! Whoever requested this is awesome. Rufus is a cutie. And he doesn't even look that old! I've got mine today, just in time because I went to my family for Openermas and New Year today. Will open it only on Openermas.